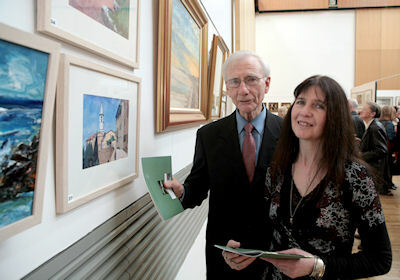 The Concourse Arts Centre at Dun Laoghaire County Hall reverberated last Sunday (March 31) with more than 200 guests of the Dublin Painting & Sketching Club who were attending the opening reception of the Club’s 130th Annual Exhibition. The Club is one of our oldest artists’ organisations, dating back to 1874. Exhibiting artist Richard McEvoy of Cabra, Dublin, and daughter singer/songwriter, Marion McEvoy. The many exhibiting artists, their family and friends, together with the art enthusiasts and buyers, thronged to the bright spacious Concourse Centre to enjoy the wine and view the record number of 287 paintings, prints and drawings on show throughout the afternoon. The 2-week exhibition is one of Ireland’s largest annual group shows and this year saw as many as 82 well known Irish contemporary artists taking part. 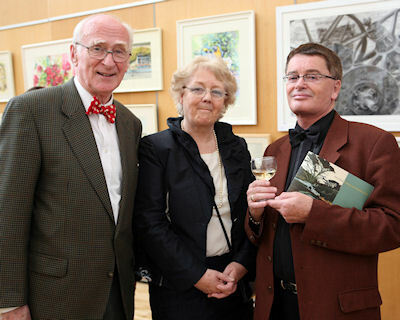 Exhibiting artists Dr. Thomas Wilson of Shankhill, Dublin, and Pat O’Breartuin of Rathfarnham, Dublin, with Jim Harkness. No user commented in " Dublin Painting & Sketching Club 130th Annual Exhibition "